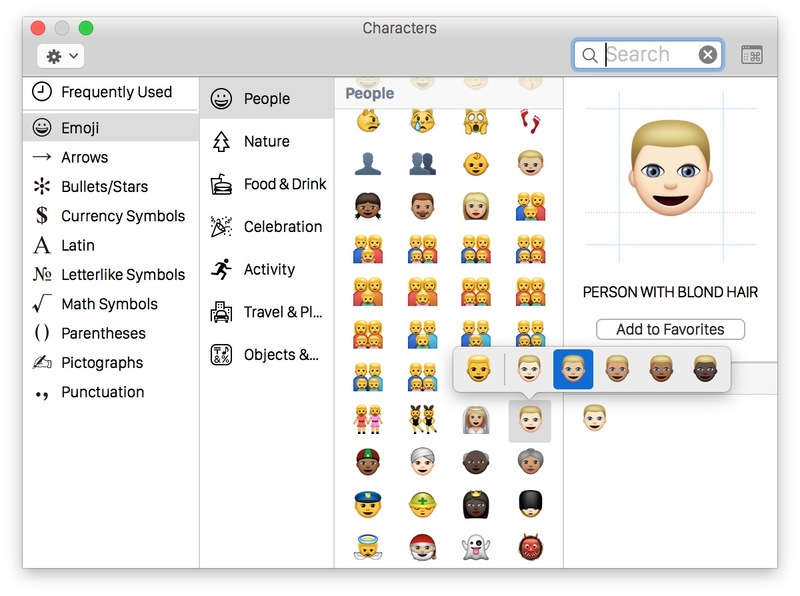 Now that many of our Emoji characters have various skin tones in iOS and OS X, you may want to access and use the new diverse emoji icon set on the Mac. This is quite simple, but do note that not all Emoji have the diverse skin and hair color options. Generally speaking, it’s the solitary Emoji people emoticons which allow for adjusting the skin tone away from the cartoon yellow default. For the emoji that support skin tone modification, there are six different diverse options for shading; the default deep rich yellow, a light skin tone, a medium light skin tone, a medium skin tone, a medium dark skin tone, and a dark skin tone option. In case you were wondering, those skin shade descriptions are how Apple describes them if you define or speak the Emoji in either Mac OS X or iOS. So, let’s quickly learn how to use the new Emoji! Once you’re in the standard OS X Emoji character screen, simply clicking and holding the click for a moment will make the Emoji skin tone options appear in OS X. Select the emoji skin shade you want to use and it will become the new default skin tone for that particular emoji character. For Mac users with Force Touch trackpads, a secondary harder tap also makes the skin tone modifier appear. If you double-click it will place the Emoji character into the active text field as usual. It’s worth remembering that not all emoji people icons have adjustable skin tones, at the moment anyway. For example, all of the family and group people emojis are currently stuck in the deep yellow shade. It’s quite possible that future versions of the Emoji character set will allow the group and family characters to be adjustable as well. This Mac click-and-hold trick is basically the same as using the tap-and-hold to access diverse Emoji in iOS on an iPhone or iPad, so once you’re familiar with it on the mobile or desktop side you should find no issue remembering on the other operating system as well. For Mac users you’ll need OS X 10.10.3 (or newer) to access the character set, and iPhone users will require iOS 8.3 or newer. How do you get it to show up in the most used in iOS? Mine wont show. The Live Long and Prosper emoji that is. If you repeatedly use the Live Long and Prosper Emoji icon in OS X or iOS it will start to appear in your “Frequently Used” list of Emoji icons automatically. An easy way to do this on the Mac is to copy it to your clipboard, visit a text field, and paste it repeatedly. You can also paste it into the “Search” field of the Emoji character selector, and choose to add it to your favorite Emoji list. I think we should be able to pick skin color of any color, and hair color of any color for all Emoji. How it should work: Get a color picker when you hold down the Emoji icons, let you pick any color scheme you want. I want to be able to change the color of the dogs and cows, and the cactus and the trees. I want to make a yellow snowman (you know why, oh you know why). I want to paint the houses pink. Design, code and get it all ready to go P. and maybe they will include that. I’m in awe of this truly revolutionary technology by Apple. But everyone would agree Emoji is important nowadays isn’t it? This has got to the be absolute LAST thing I care about. What I do care about is getting the bugs fixed. If Apple is so concerned about having multiple skin tones, why not include all of them? There are far more skin tones in the human race than these. And what about red-heads? Is Apple prejudiced against red-heads? And what about guys with no mustache? I feel discriminated against. These emojis are offensive to me because I don’t have a mustache. I may sue. I am not amused. I am offended. There are serious issues with OS X Yosemite that need to be addressed – yet Apple’s development team releases new emoji? I am perplexed. Perhaps it’s time to dump my Apple stock while it’s still high, because it’s clear this company isn’t going in the right direction. Whether to dump your Apple stock is only your decision. I’ve been an Apple user for 20+ years. I don’t understand the hit and miss attitudes at Apple now. iTunes12 is a disgusting Excel experience. I have a $30 watch I wear daily that tells me time and day, just as easy as a $400 iWatch which seems to dominate everything spoken from Apple for the past several months. Why is the CEO so giddy about this wasted product? I plug my devices into my iMac via a USB2 stick. Yosemite10.10.3 tells me the stick may not be compatible? It was in 10.10.2 and all other system versions. I see on a Macbook that there will only be ONE plug for connecting devices. I have three devices. What the hell is Cook’s logic? I wish Steve’s ghost would appear and kick the crap out of the direction they are taking. How about bringing back old icons ?? Hate the flat!! I am very happy about this! So happy it made me dance. This isn’t something that widely represented people with TUNNEL VISION would care about or value but I am sure most if not ALL non-white apple users and those who like diversity will appreciate this! So glad they are thinking more inclusively, very good move. Why did Apple chose to default to that daft Simpson color scheme? No comments about the dimensions of the market in China now, please ;) Why can’t we change ALL emojis to default to a different – our – color? Why do we have to go through all of them to set the color? Who needs different colors in the 1st place?